I guess this story is sort of Halloween-appropriate, since it involves a severed body part. It’s a fake body part, but still. A history professor from Texas believes there’s an appropriate place for Mexican general and president Santa Anna’s artificial leg and it isn’t the Illinois State Military Museum in Springfield. Teresa Van Hoy thinks it should be returned to Mexico, where he headed the Mexican government 11 times. The state says it is staying right here. Van Hoy is a history professor at St. Mary’s University in San Antonio, Texas, which also is home to the Alamo, the mission famous for its 13-day stand against Santa Anna’s army in 1836. She was in Springfield Friday with about two dozen students who constructed a “Day of the Dead” memorial at the statue of Abraham Lincoln on the state Capitol grounds. The memorial is intended to recognize Lincoln’s “career-long solidarity with Mexico, Mexicans and Mexican Americans,” the university said in an announcement of the trip. They were accompanied by a crew producing a film called “Santa Anna in the Land of Lincoln,” which is part of a project of the class. The leg is housed at the military museum at 1301 N. MacArthur Blvd. It is currently not on public display as part of the museum’s practice of putting some artifacts in storage periodically. It is in the Illinois museum because soldiers from Illinois captured the leg during the battle of Cerro Gordo in 1847 during the Mexican-American War, also known simply as the Mexican War. I just want to note that if I’d known the State Military Museum had Santa Anna’s wooden leg when I was in Springfield, I would’ve skipped the ALPLM and gone there instead. Santa Anna was eating in his carriage and had removed his artificial leg when the Illinois soldiers surprised him. Santa Anna escaped, but he left the leg behind. The captured leg, which was made in New York out of cork, is probably the most famous artifact in the military museum. Van Hoy said the history goes beyond just Santa Anna’s leg. “There is a really rich history here and unfortunately, so far in my view, it has been reduced to a freak show exhibit which doesn’t do full honor to the people of Illinois or the veterans of Illinois,” she said. Leighton said the leg is a tribute to the 68 Illinois soldiers who died during the battle of Cerro Gordo and the 98 who died during the war. I think it’s interesting that neither Van Hoy nor Leighton base their arguments on whether or not the leg serves any educational or interpretive function. Leighton wants to keep it because it “honors our soldiers,” while Van Hoy wants to send it back because it’s “toxic” for Americans and people of Mexican descent. From a curatorial standpoint, I don’t think there’s anything inherently immoral or “toxic” about putting the leg on display. Museums are full of items that were captured as war trophies—weapons, flags, bits of uniforms—and remain on exhibit because of their historical significance. If Van Hoy wants to make a case that Santa Anna’s leg isn’t a proper subject for an exhibition, she has her work cut out for her. If I was a curator, I wouldn’t pass up the chance to exhibit such a compelling object. With proper contextualization, you could use it to teach visitors something about why Illinois troops would claim such an object as a trophy, how nineteenth-century Americans understood Mexico and the war, and so on. At the same time, however, I’m not totally on board with Lt. Col. Leighton’s argument for keeping the leg in the museum, either. Rather than invoking the object’s interpretive or educational utility, he argues that it was bought with “Illinois blood” and that it honors the service of Illinoisans. Both of those statements may be true, but they fail to take into account some of the nuances surrounding the repatriation of historical artifacts. Of course, I’m well aware that I’m bringing my own inclinations and biases to bear on this question. As a museum guy, I see the object in terms of its historical and educational significance. As a soldier, Leighton sees it as a validation of the military sacrifices of his comrades, past and present. And as someone concerned with the history of Mexican-U.S. relations, Van Hoy sees it as a symbol of the long, troubled relationship between the two nations. In other words, people engage the past from many different perspectives, and not all of them are detached and academic. Anyway, if you want to see the leg for yourself, you’ll have to wait a couple of years. The museum has temporarily taken it off exhibit for a little TLC. Sounds like they’re taking better care of it than Santa Anna did. If you haven’t already, read Ann E. Michael’s defense of libraries with real, physical, honest-to-goodness books on real, physical, honest-to-goodness shelves that you can actually browse. Seems odd that this is a concept in need of defending, but that’s this century for you. During a recent meeting at my college, a high-level administrator suggested that our campus library — a relatively new and spacious building — was too full of windows and good views to be devoted merely to storing books. Essentially, he was promoting the idea of off-site text storage, with an eye to moving student-resource departments — tutoring, the writing center, retention — into the library. Study centers instead of book stacks. I have a stake in that proposal, as I am the writing-center coordinator. If I’m honest, I’ll admit how much I would love to get my peer tutors out of our classroom-building basement and into the library. It is a terrific space. I don’t think it’s the right move for the college, however. Downsizing the stacks and increasing student and faculty reliance on virtual sources limits the silent conversation between people and books, arrests the opportunity for surprising encounters with unexpected materials, and thus dampens synthesis — the very stuff of new ideas. That’s very true; the simple act of looking over the shelves, of getting a sense of what information is available on a given topic simply by taking a few steps down an aisle, is a very useful step the research process. I think every historian has had those moments where they’ve been looking for one book and accidentally stumbled across another that opened up a new and profitable line of investigation. Sure, some libraries’ online catalogs allow you to “browse” the titles shelved near a particular book electronically, but there’s no substitute for putting in a shoe leather. I get why libraries want to minimize the amount of space devoted to stacks. Those coffee shops, art displays, and Zen mindfulness seminars have to go somewhere. But, if you’ll indulge a rant, my problem with doing away with open stacks is twofold. First, libraries are just about the only institutions set aside for providing access to books. If I’m hard pressed for coffee, I can hit Dunkin Donuts or 7-Eleven; if I need a copy of One Vast Winter Count, by contrast, I don’t have many options besides the library. I don’t have a problem with a coffee shop in the library, just as I don’t have a problem with an ATM inside a Burger King. But when they start dismantling the broilers to fit in more ATM machines, somebody needs to stop and remember what Burger Kings are for. Second, the measures libraries use to minimize shelf space—off-site storage, closed storage, and e-books—are a major pain in the tuchus. Who wants to have to notify a library ahead of time so they can send a guy to a warehouse to pick up a book that you could’ve walked in and grabbed for yourself? And e-books…do not get me started on e-books. I’m not at all opposed to electronic texts. Yesterday, in fact, I sent an e-mail to a reference librarian telling her how much I love one of the new databases that UT’s library is trying out. I freaking love being able to sit in my apartment and download primary source material. It’s saved me countless hours and a great deal of money in the past few years. But when it comes to reading academic titles, though, I have never—and I mean never—had a good experience with using electronic books provided through a library subscription. Pages invariably fail to load. The images don’t configure on my device properly. And forget checking references. With a physical book, all you have to do to check out an endnote is riffle through the pages with your thumb and forefinger. Good luck trying that with an e-book. Ever tried to read a military history book online, moving back and forth between text, maps, orders of battle, and references? I’ve had proponents of e-books remind me that multiple patrons can check out the same electronic book simultaneously, something that’s impossible with physical books unless a library has more than one copy. And I’ll admit that it’s a great feature of electronic books…on those occasions when you can actually use them that way. In practice, however, a lot of the libraries I’ve used only permit one simultaneous user per e-book. This doesn’t just eliminate the biggest advantage e-books have over hard copies; it can also make it impossible for even one reader to use a book for any substantial length of time. I’ve often been trying to read an e-book only to have something go haywire with my connection, my device, or the library’s website. When I attempt to access the book again, I’m unable to do so, because the website informs me that someone is already using it. That someone, of course, is me, since getting booted off the site prevents me from logging out, so as far as the website is concerned, I’m still reading the book. Electronic texts and off-site storage might save your library some space. But the people who need to get at information, who need the library for those things that only libraries can do, will foot the bill. And they’ll be paying up with a whole lot of frustration. Here’s an event for all you East Tennessee devotees of Lincoln, the Civil War, and legal and constitutional history. Dr. Daniel Farber will deliver the annual R. Gerald McMurtry Lecture at Lincoln Memorial University’s Duncan School of Law at noon on Thursday, Oct. 27. The title of his talk is “Lincoln and the Transformation of American Constitutional Law.” LMU’s Abraham Lincoln Institute for the Study of Leadership and Public Policy is sponsoring the presentation. Farber is Sho Sato Professor of Law at UC-Berkely. He is a prolific scholar whose books include Lincoln’s Constitution, A History of the American Constitution, and Retained by the People: The “Silent” Ninth Amendment and the Constitutional Rights Americans Don’t Know They Have. The lecture itself is at the LMU-DSOL building at 601 W Summit Hill Drive in Knoxville, but you can also watch via simulcast at the Abraham Lincoln Library and Museum on the Harrogate campus. Can you see Russia from your American history class? An Iñupiat seal drag made ca. 1900, one of the objects in the exhibit. After killing a seal, the hunter slit the animal’s jaw and looped the leather thong through the hole, and then attached the loop to a longer line to haul the carcass across the ice. Right now the McClung Museum has a special exhibit curated by Christine Dano Johnson, a UT grad and former intern. 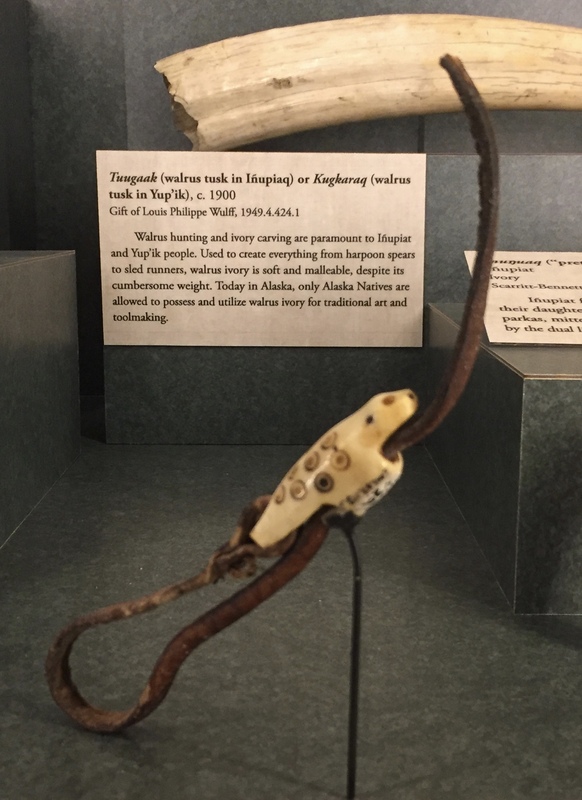 It showcases items made by Yup’ik and Iñupiat people of Alaska in the late nineteenth and early twentieth centuries, and developed out of Johnson’s research into the museum’s collection of Native Alaskan and Pacific Northwest material. She came back to the museum this week to discuss her research with an anthropology class. When I sat in on her presentation, it occurred to me that I don’t recall discussing Alaska, the Pacific Northwest, or the inhabitants of these places at any length in any history class I’ve taken or taught, from grade school all the way to graduate seminars. I’d wager the same is true of most history classes. Do history courses need Alaska and its Native inhabitants? My Ph.D. adviser asked my classmates and I a similar question during the first meeting of an early America seminar. We were discussing the geographic and temporal boundaries historians use to define “colonial America.” Alaska, after all, was a Russian colony in the eighteenth and nineteenth centuries. My adviser asked us to consider whether we need to incorporate this into our understanding of colonial America in order to make sense of it and to do the subject justice. It’s an interesting—and provocative—question. Most people associate colonial America with the eastern seaboard, while historians with a more expansive geographical vision have been careful to point out that the thirteen seaboard English provinces weren’t the only colonies out there. The borders of colonial and early America have opened up in recent years. But Alaska? I think it’s a rare study indeed that considers its colonial experience to be part of either colonial or early American history. Alan Taylor’s especially expansive and inclusive overview of colonial America is, of course, a notable exception. Changes in geographical perspective can lead to interesting chronological reconceptualizations, too. It’s no coincidence that Taylor’s continental studies of colonial America and the Revolution have later chronological end points than other, more geographically restrictive accounts. Alaskan history forces us to reconsider when colonial America ends as well as where it ends. It remained a European possession a century after those British colonies gave their king a pink slip. My point is not that every history course “needs” to cover Alaska and its inhabitants, but rather that greater attention to places we dismiss as marginal can prompt us to think and teach about the whole fabric of American history more creatively and intelligently. If we want to shake up the ways we conceive of geographical, temporal, and demographic boundaries, Alaska could be a good place to get started. The next time you’re putting together a syllabus, a little subarctic air might just prove invigorating. I’ve had The Birth of a Nation‘s release on my calendar for quite some time now. I’m always eager to see major motion pictures based on historical events, and given BoaN‘s astounding reception at Sundance, I was looking forward to a landmark movie. But a few informed reviews convinced me to skip opening night. In fact, I’m starting to wonder if I should shell out money for a ticket at all. Contrary to his promises of “historical fidelity,” Parker created a deeply flawed, historically inaccurate movie that exploits and distorts Nat Turner’s story and the history of slavery in America. Nearly everything in the movie—ranging from Turner’s relationship with his family, to his life as a slave, and even the rebellion itself—is a complete fabrication. Certainly the film contains sprinklings of historical fact, but the bulk of Parker’s story about the rebellion is fictitious: Nat Turner did not murder his owner, nor did he kill a slave patroller. Turner’s rebellion was not betrayed by a young boy, or by anyone else involved in the revolt. To the contrary, the rebels fought until the bitter end. The shootout depicted in Jerusalem, Virginia, never happened, because the rebels were stopped by the militia before they ever reached Jerusalem. The list of inaccuracies, distortions, and fabrications goes on and on. A crucial turning point in the movie occurs when Turner’s wife, Cherry, is brutally gang raped by a group of slave patrollers—an attack the film portrays as the spark that ultimately drove Turner to launch his rebellion. But there is not a shred of historical evidence to suggest that Cherry was ever raped by slave patrollers, nor is there any evidence to indicate that an attack on his wife inspired Turner to rebel. By all accounts, Turner took up arms against slavery because he believed slavery was morally wrong and violated the law of God. The male slave rebels who joined him could not have succeeded without the help of longstanding support networks embedded in community life. Black women, free and enslaved, were not solely the victims of brutality that inspired men to resist, as portrayed in the film. They were also active participants in and witnesses to an event that proved catastrophic for their community just as they participated in the everyday resistance of their communities. The Birth of a Nation is not an excerptable, classroom-ready movie. A screening of Parker’s film is not the place to learn about antebellum Southampton County or the lives of the enslaved and free African Americans who lived and labored there. It is also not the place to learn about the slave rebellion produced by this community in late August 1831. All this is disappointing to hear. Between the plaudits from movie critics and the censures from historians, perhaps The Birth of a Nation is to antebellum slavery what The Patriot was to the American Revolution: a film that is entertaining and well-made, but not grounded in the history behind it. Since The Birth of a Nation features real people and purports to tell the true story of a neglected event, its historical sins might be more serious than those of The Patriot, where the plot revolved around fictional characters. Any filmmaker who claims that his motive is to bring a forgotten episode to public attention, I think, has a greater responsibility to the truth. Regardless of whether The Birth of a Nation is the movie this story deserves, I think we’re living in a sort of golden age of black historical cinema. In just a few years, we’ve had 12 Years a Slave, Selma (which had its own historical issues, of course), the depiction of a violent and troubled Reconstruction in Free State of Jones, and now a Nat Turner film. In addition, the Black Lives Matter movement has prompted some interesting discussions about the historical context for current racial issues. Americans might not be talking about the history of race and slavery with accuracy, but one thing’s for sure: we’re taking about it more than we used to. Here are three upcoming lectures at the University of Tennessee you might be interested in if you’re a a history aficionado. First up is the 2016 Charles O. Jackson Memorial Lecture, held every fall semester in honor of a former faculty member in the Department of History. This year’s speaker is Dr. Elliott West, Alumni Distinguished Professor of History at the University of Arkansas and past president of the Western History Association. His books include The Contested Plains: Indians, Goldseekers, and the Rush to Colorado (winner of the Francis Parkman Prize) and The Last Indian War: The Nez Perce Story. Dr. West will be discussing the West before Lewis and Clark. This talk is this coming Monday, Oct. 3 at 5:00 p.m. in UT’s Howard Baker Center, room 103. Later this fall, the McClung Museum is hosting two lectures on Knoxville’s history in conjunction with the new exhibit on historic archaeology and in celebration of the city’s 225th birthday. On Sunday, Oct. 30 at 2:00 p.m. Jack Neely will present “Subterranean Knoxville: The Buried Narrative of a Distracted City” in the museum’s auditorium. Neely has written a number of books on Knoxville’s history, including Market Square: A History of the Most Democratic Place on Earth and Knoxville: This Obscure Prismatic City. He is also a longtime journalist, a regular contributor to the Knoxville Mercury, director of the Knoxville History Project, and the guy who probably knows more about this city and its past than anybody. On Sunday, Nov. 6 at 2:00 p.m. Kim Trent of Knox Heritage will be at the museum to discuss historic preservation in Knoxville. The folks at Knox Heritage have been working on behalf of this city’s historic structures for years, and they do some great stuff. All three of these events are free, so if you’re in the Knoxville area, come by for a little historical edification. And if you haven’t seen Knoxville Unearthed yet, you can check it out while you’re here.